On Thursday, September 14, MSJ will start a heavily revised advisory period. 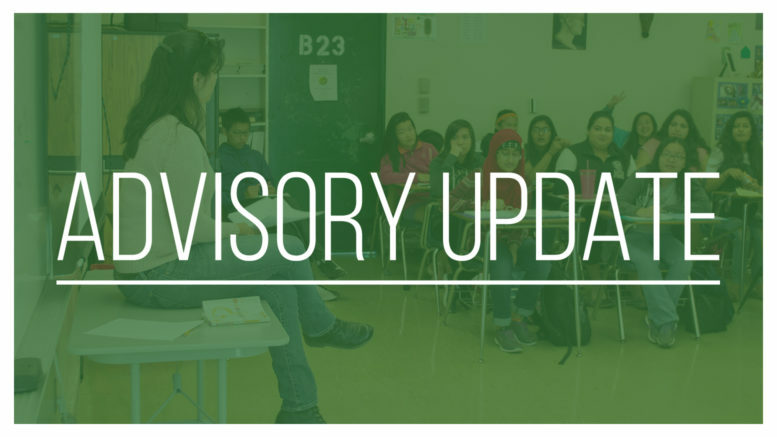 Though advisory will continue to be from 9:55 a.m. to 10:41 a.m. on Thursdays, students will now have to first check in at their third period classroom, after which they may go to other teachers’ classrooms or an activity if they have the consent of the other classroom’s teacher. Advisory at MSJ started during the third week of school last year, replacing read on Thursdays. The old advisory was structured as a time for department teachers to collaborate with each other and for students to study together, relax, or participate in an activity. Each department alternated between having an advisory to collaborate and having to host students in its classrooms. Students, with the exception of popular areas such as the library, did not have to sign up to go to a specific room. Instead, they had to keep a stamp card which was stamped by the teacher or administrator in their advisory room and shown to their third period teacher. According to Vice Principal Jeff Evans, the main issue with the previous advisory format was that it was difficult to keep track of where a specific student was at any given time during advisory since the stamp card only told where a student had been during advisory after it had ended. In the event of an emergency, locating students would be an inefficient process, as there was no system in place that kept track of where students were. Moreover, intercom announcements would not always reach all students, as there are some “dead zones” at MSJ where the intercom cannot be heard. In designing the new advisory, the administration looked closely at how other schools ran their advisories. “We looked at primarily Irvington and Kennedy because they’ve had advisory for a long time, and Irvington’s is similar to ours now,” said Evans. The revised advisory is geared towards alleviating the problem of student accountability. According to Evans, students will be required go to their third period classroom before the start of advisory. Their third period teacher will take attendance at the beginning of advisory, so all students are accounted for. During advisory, teachers have the option of holding activities for their class, or simply letting the time be an extended read or study period. If students wish to go to the library, another classroom, or an activity such as a presentation in C-120, they must first obtain a pass the day before from the adult in charge of that room. Students will still have to report to their third period classroom for attendance, but they can leave with a valid pass once it is done. For now, passes can be in any form the adult in charge of the activity chooses, but the administration does plan on creating a universal pass in the future. To adjust to these changes, there will be fewer activities offered initially compared to last year. “There won’t be anything open the first week. Then we’re going to start branching out, slowly at first. We’ll have the library, [and] we’ll probably do something in the flex room or C-120,” said Evans. A new collaboration system for teachers will also be adopted. “Teachers that do not have a third period class will be assigned particular positions by the administration to help facilitate collaboration for other teachers if they so desire,” said Fremont Unified District Teachers Association Representative Lane Melcic. Examples of this include supervising the flex room or covering another teacher’s class while that teacher collaborates with another teacher. As of now, no other major changes to advisory are expected to be made this school year, and any issues that arise will likely be addressed in later years’ advisories. “We’ll do it, we’ll see how it works, we’ll see if the accountability factor worked for us then change it. We don’t like to make big overhauls and change it every year, so hopefully this will be pretty consistent,” said Evans. Be the first to comment on "MSJ Implements Revised Advisory System"